SPNN Open Labs (SOL) is up and running again for the fall! Lots of youth have been stopping by to work on media projects. We have returning youth from the Hmong Pioneers who came in to complete their final video from the summer. A member from this summer’s Youth Intern Program is also back to produce a video for a school class on bulimia, and a participant from the Createch Studio is working on a documentary about the impact of social media on youth. We encourage middle and high school youth to come in and work on independent media projects during this open time. In addition to SOL, the Createch Studio is now happening on Tuesdays at the Arlington Hills Community Center. Teens are learning how media tools can be a career exploration opportunity. Recently, youth have expressed interest in photography, drawing and voice characters. We are helping teens learn how they can express themselves through talent,visuals and stories in media. We will be planning photoshoots for November, as well as workshops on voice character with animation, and how to draw on a tablet in Photoshop. Teens from the Createch Studio have displayed a strong interest in strengthening their skills and participating in SOL at SPNN. We have seen the time we spend with teens foster creativity and artistic risk taking. We are excited for another year of SOL and Createch, and hope to see you there! 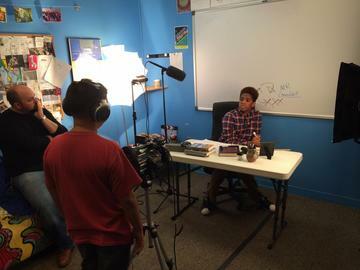 SOL takes place at the SPNN Youth Media Lab every Monday during the school year from 3-6pm (excluding SPPS holidays). SOL is free and open to all St. Paul middle and high school youth. Createch with SPNN Youth takes place every Tuesday from 4-6pm at the Createch Studio in the Arlington Hills Community Center.